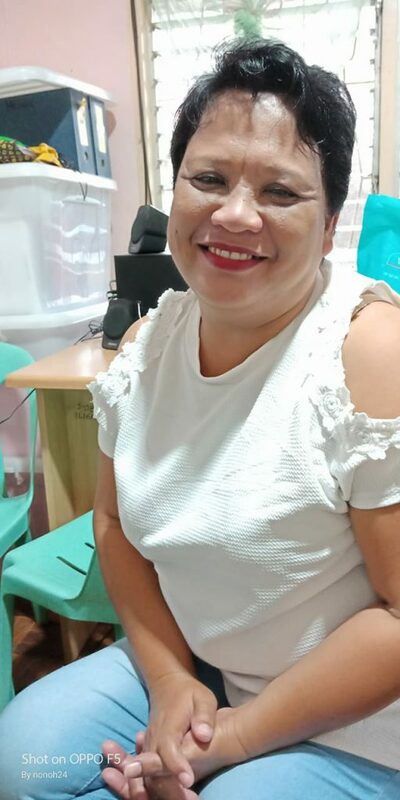 Aralyne T. Balbin, 50 of Iligan City cleans an office daily to earn a minimum daily wage to support her extended family. As a janitor, Aralyne’s income does not meet her family’s needs. Being the only child of her family, Aralyne took the responsibility of caring for her aged parents, aside from taking care of her grandchildren and her children who are staying with her. The widow supports the family of her unwed children since the latter has no regular source of income. Infected with bronchial asthma, Aralyne, a solo parent to seven children, has to divide her meager income for the family’s daily sustenance and for her medicines. Her agony doesn’t stop there. Aralyne’s father is diagnosed with prostate cancer. Her father has been going in-and-out of the hospital due to the infections and complications brought about by the prostate cancer. Aralyne felt helpless at that time, finding some remedies to help her defray the cost of hospitalization of her father, aside from the fact that she has to support her family’s needs. Until she learned that the Department of Social Welfare and Development (DSWD) helps individuals who are in crisis. DSWD has various programs and services. Under the Protective Services Division are range of interventions to individuals, families, and communities who are in crisis or difficult situations, such as those affected by or vulnerable to disasters. As such, the provision of Assistance to Individuals/Families in Crisis Situation (AICS). The AICS, enhanced on 2015, is offered to every opened satellite office in every province of Northern Mindanao for it to become more accessible to individual and families in need of assistance due to unexpected crisis such as illness, loss of love ones and other related crisis situation. Aralyne went to the satellite office in Iligan City to avail of the AICS. “Dako kaayo og ikatabang sa amoa ang AICS, ilabina 76 years old na akong papa ug uban sa akong mga apo nga walay mga papa na naa sa akoa,” she said. (AICS is a big help to us, especially that my father is now 76 years old and my grandchildren who have no father are staying with me). Aralyne availed of the educational assistance first for her youngest daughter to augment the educational expenses. “Insakto kaayo nga naa sa Iligan Sattelite Office sa DSWD ang AICS, dili nako kinahanglan moadto’g Cagayan de Oro o sa Tubod aron makakuha ko,” she said. (It was timely that AICS is offered at Iligan Satellite Office of DSWD, I don’t have to go to Cagayan de Oro City or in Tubod, Lanao del Norte to avail of it.) She added that it answers all her prayers to find money for the enrollment of her youngest daughter. “I had availed of the medical assistance twice a year for my maintenance medicines. Recently, I availed the assistance for my father and grandchild because they were confined in the hospital,” she disclosed. Aralyne stressed that AICS program of DSWD really help those people who are in need especially those who loss family members which is very important. “Ang AICS dako kayo katabang labi na sa namat’yan. Pasalamat jud ko naa financial assistance diri sa DSWD,” she confessed. (AICS is a big help, especially for those whose love ones died, I am thankful of DSWD’s financial assistance). She rated the program from 1-10 as 10 due to her satisfaction to the implementation of the program and the benefits provided by the program. She hoped AICS provision will be sustained and will be continually implemented to benefit those who are in need and in crisis. Aralyne Balbin, a utility worker, always wear a smile despite the trials in her life like in this photo with her friends from DSWD Satellite Office in Iligan City. Photos grabbed from Aralyne’s Facebook account.